Hi! 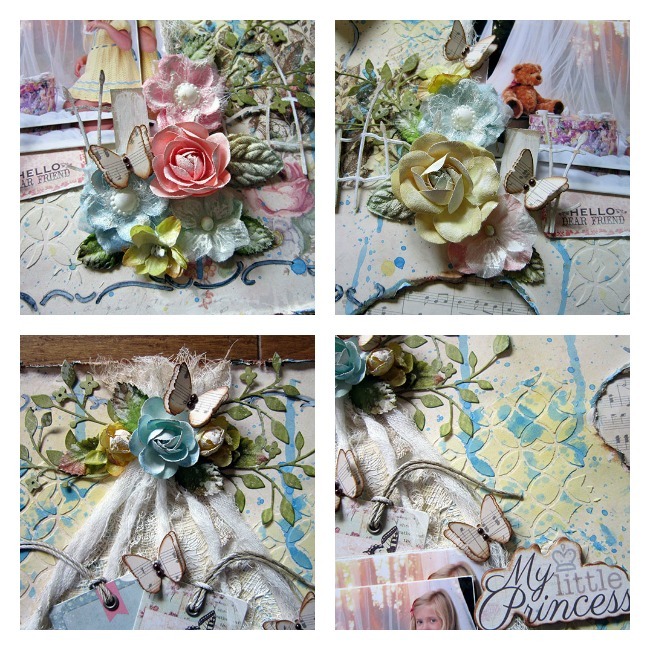 Bonnie blogging today, and I will be showing you 2 layouts that I have made with the gorgeous May kit! These 2 layouts feature 2 darling sisters, and are very special girls, especially to their Mother, who is my cousin! Thanks Karen for sharing your photos with me! The papers in this kit are so soft and delicate and suited my subjects perfectly. In my first layout, I tried to recreate the background in which the photo could of been taken. I really loved the netting surrounding Madelyn and her bear friend and I mimicked that using cheese cloth. I used the blue and yellow sprays from the MMM kit to represent the sun and the sky. They also went perfectly with Madelyn's dress! 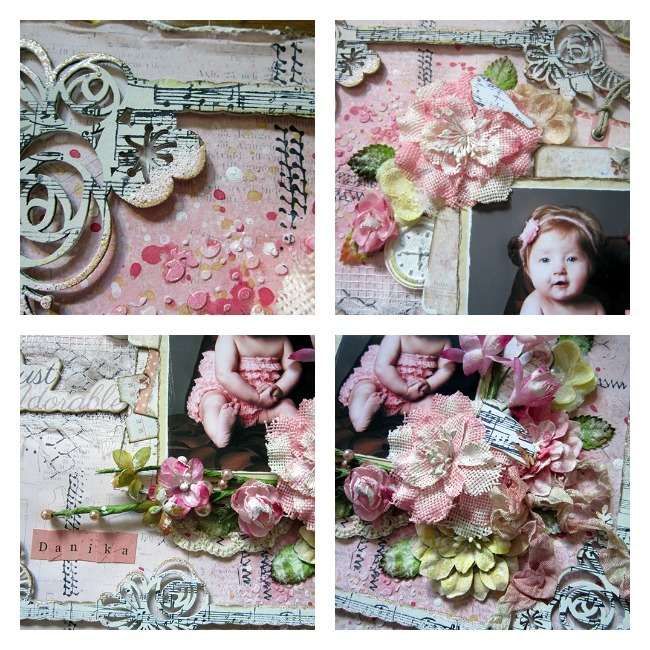 To create this layout I used the Main kit, the Embellishment add on, the Flower add on and the MMM kit. From my own stash I used, molding paste, gesso, cheese cloth, stamps, archival ink, chalk ink, dies, leaves, butterfly punch. Here we have Danika, a living doll! 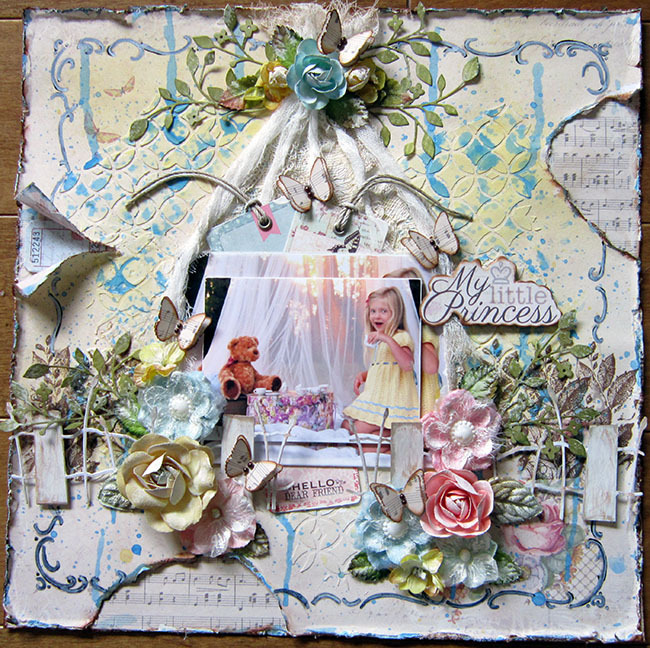 I did lots of layering with the papers and tags and such that came in the kit and add ons. I really loved the Blue Fern Chipboard frame, and I painted it white, and then I stamped on it with a musical stamp, and then used the embossing enamel and yellow paint along the edges. So much fun to alter! I did some random stamping and a little bit of mixed media work. 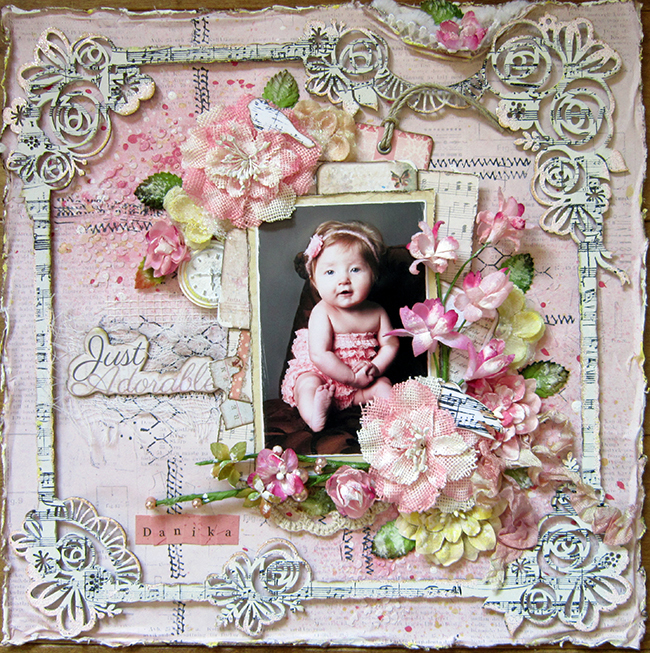 To create this layout I used the Main Kit, the Embellishment add on, the Flower add on, and the MMM Kit. From my stash I used: stencil, molding paste, mists, stamps, archival ink, die, leaves, lace. Thanks for stopping by and please visit my blog over the next few days for more reveals from the May kit from me! Tune in tomorrow for our total kit reveal! You will not be disappointed! 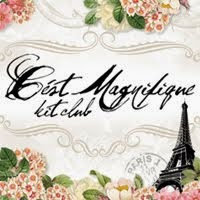 Magnifique Mixed Media Kit with Erin! One Last Look at the April MMM Kit! April Bits & Pieces Giveaway!